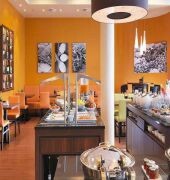 Courtyard by Marriott Basel is a 4-star property located in Pratteln, within 10 km away from the city of Basel. 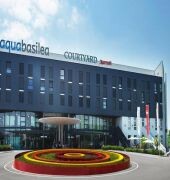 The hotel has direct access to Aquabasilea water park, where guests have special privileges. All spacious and comfortable accommodations are equipped with an individually controlled air conditioning, in-room safe, coffee/tea making facility, mini refrigerator, satellite TV and private bathroom with hair dryer. 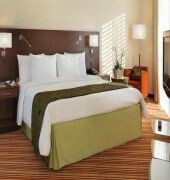 Furthermore, the rooms have a work desk with ergonomic chair and lighting, ironing facilities and high speed internet access. From breakfast to multi course dinner, the in house restaurant, lounge and bar offers a freshly prepared meals that range from traditional Swiss dishes to specialties from all over Europe. EuroAirport Basel-Mulhouse-Freiburg is 18 km away.